1899: Launched by Dundee Shipbuilders’ Co Ltd, Dundee (Yd.No.123) for Atlantic Steam Fishing Co Ltd (64/64), Grimsby as MAGNIFIC. 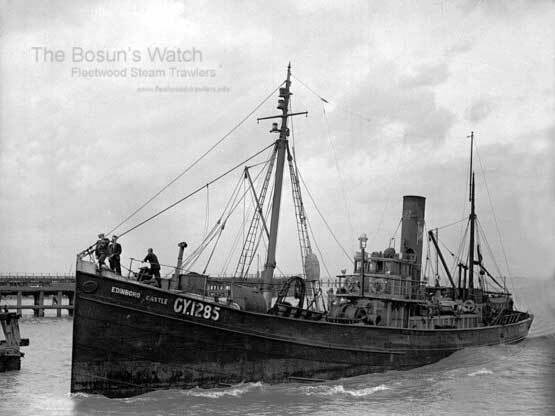 24.4.1899: Registered at Grimsby (GY8). 24.4.1899: Robert Walter Windeatt designated manager. 2.5.1899: Vessel mortgaged (64/64) to The York City & County Banking Co Ltd, York (A). 7.6.1900: Sold to Grimsby Steam Fishing Vessels’ Mutual Insurance & Protecting Co Ltd, Grimsby. 29.6.1900: Sold to Hugh McIntyre (64/64), Glasgow. 11.6.1900: George Jeffs designated manager. 9.7.1900; Hugh McIntyre designated managing owner. 9.4.1901: Sold to C. T. Bowring & Co Ltd (64/64), Liverpool. 18.4.1901: Grimsby registry closed “Coasting”. 18.4.1901: Frederick Charles Bowring designated manager. 4.1901: Registered at Liverpool. Based Halifax, Nova Scotia and engaged trawling on the Newfoundland banks. Results only judged to be “fairly successful”. 11.1903: Sold to James Codling, John William Hobbs & Arthur James Baxter, all Grimsby (joint owners 64/64). 27.11.1903: Vessel mortgaged (64/64) to C. T. Bowring & Co Ltd, Liverpool for the sum of £5,500 with interest at 6% (B). 30.11.1903: Arthur James Baxter designated managing owner. 2.12.1903: Registered at Grimsby (GY1285). 1.1.1904: Registered at Grimsby as EDINBORO’ CASTLE (GY1285) BoT Minute 23790/05). 28.1.1908: Vessel sold by mortgagee under mortgage (B) to John William Hobbs, Leonard Brocklesby & Arthur Oscar Burns, all Grimsby (joint owners 64/64). 29.1.1909: John William Hobbs designated managing owner. 29.1.1909: Vessel mortgaged (64/64) to C. T. Bowring & Co Ltd, Liverpool for the sum of £3,125 with interest at 6% (C). 6.7.1909: William Acaster, Fleetwood designated managing owner at Fleetwood. 9.7.1909 – 10.1.1910: Running Agreement. Fishing out of Fleetwood (Sk. Sam Edwards, Knott End). 28.1.1910 – 1.7.1910: Running Agreement. Fishing out of Fleetwood (Sk. George Albert Novo, Fleetwood). 28.1.1910: William Acaster, Fleetwood designated agent for managing owner. 28.4.1910: Vessel mortgaged (64/64) to Stamford, Spalding & Boston Banking Co Ltd, Lincoln (D). 3.1.1912: Mortgage (C) transferred to The Lincoln & Lindsey Banking Co Ltd, Lincoln (C). 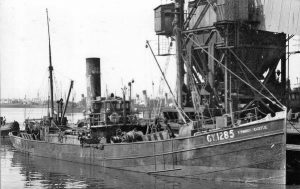 13.6.1912: Sold to The Waverley Steam Fishing Co (Grimsby) Ltd (64/64), Grimsby. 13.6.1912: Vessel mortgaged (64/64) to The Lincoln & Lindsey Banking Co Ltd, Lincoln (F). 15.6.1912: Alfred Bannister designated manager. 27.9.1912: Sold to Alfred Bannister (64/64), Grimsby. 17.10.1912: Vessel mortgaged (64/64) to Barclay & Co Ltd, London (G). 17.10.1912: Alfred Bannister designated managing owner. 1.1.1914: Tonnage altered to 94.29net under provision of Merchant Shipping Act 1907. 6.1915: Requisitioned for war service. Fitted out as a boom trawler. Based Milford Haven. 18.8.1915: Sold to William Barton & Alfred Bannister, Grimsby (joint owners 64/64). 20.8.1915: Alfred Bannister designated managing owner. 3.9.1931: Probate granted to William Barton (64/64), Grimsby. 1.12.1931: Bernard H. Bannister designated manager. 8.12.1931: William Barton shares (32/64) sold to Fred Bannister, Cleethorpes, Bernard H. Bannister, Cleethorpes, Harvey Wilfred Wilson, Grimsby & Thomas Henry Partington, Grimsby (joint owners 32/64). 31.12.1931: Bernard H. Bannister designated managing owner. 6.5.1944: Fred Bannister, Bernard H. Bannister, Harvey Wilfred Wilson & Thomas Henry Partington shares (32/64) sold to Alfred Bannister (Trawlers) Ltd (32/64), Grimsby. 6.5.1944: Fred Bannister designated manager. 17.4.1952: Probate granted to Elsie Barton, Gainsborough & Eric Dyson, Gainsborough, Executors (joint owners 32/64). 6.5.1952: Elsie Barton & Eric Dyson shares (32/64) sold to Alfred Bannister (Trawlers) Ltd (64/64). Grimsby. 6.5.1952: Fred Bannister designated manager. 12.1955: Sold to Jacques Bakker en Zonen, Bruges for breaking up. 06/02/2018: Removed FMHT watermark and added an image. This entry was posted in Steam Trawlers, Steamers (Picture) on January 13, 2017 by Fred Smith.